In yesterday's news report, NPR carried on a policy that we see in many news broadcasts these days. Namely, one reporter from the agency quoting another reporter from the same agency as their source, which, in itself, is sad enough. "As NPR's Greg Allen has reported, Davidson was an experienced captain: When he left port on Tuesday in the El Faro, Joaquin was a tropical storm, not a significant concern. On early Thursday when he made the radio call to the company, Davidson said the ship was listing to one side, had lost its propulsion, was taking on water." It sounds like she is relaying an evaluation of an NPR reporter, Greg Allen, about the situation, i.e., when they left port, Joaquin was not a concern. Or maybe he is putting words into the mouth of the deceased captain? In any event, this statement is tragically misleading and inappropriate. It is true that when they left port there was, in another part of the world, a storm that may not have been a concern—had they been in that part of the world, at that time. However, he was headed in that direction, and the forecast at that time, was that they would meet a hurricane when they got there. And they did indeed meet the storm more or less right at the spot and right at the time it was forecasted. These forecasts are all archived at the NHC and this can all be checked. In short, when this vessel pulled into the ocean, it could be anticipated that they would meet a hurricane, and this is indeed a concern. I posted a short article on this the day the vessel was lost, which focused on the same misrepresentation of the facts, in this case, by the AP. That analysis remains tragically valid. NPR (and anyone else parroting this same analysis) is doing a disservice to the NWS and to all mariners by this type of reporting. We teach daily the obvious fact that a storm's condition when you are not there does not matter. What matters is the condition of a storm when you are where it is. We must rely on forecasts. As I understand, it has not been established why the vessel proceeded on the path it did, but the NPR report flies in the face of all prudent navigation practice. They are presenting, in essence, a navigation and weather routing lesson to their readers that is totally wrong and can be disastrous. This morning I hear that NPR is proud they do not present fake news—a low bar at best—but the Greg Allen assessment presented is borderline, in that it is a thoughtless statement that distracts from a productive understanding of the tragic event. I must add, NPR is indeed one of the best news sources in the world. This is a rare transgression, which I mainly point out because I care about them and respect their work. We sometimes have things to thank the government for that we might not appreciate. In this case I refer to their propensity to change website addresses, often in more or less random fashion without any apparent improvement. It could be some form of job security. We thank them because when trying to find a nugget they moved or removed, we found instead a goldmine of related info at another location. The Fischer Precision Aneroid Barometer. 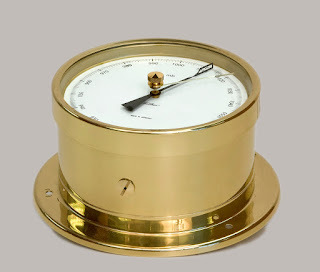 An example of state of the art barometer workmanship. The NWS, for example, recently changed many if not most of the links to where they store weather data, but that is not the example at hand. Sometime ago, we discovered that NOAA had put online a copy of the remarkable book Manual of Barometry (WBAN), the mother of all bibles of barometer related science. In our announcement of this with a short description of the book we included the link to NOAA for the document. It is that link which has now gone missing. And sure enough, the Analog Weather site was smarter that we were; they actually downloaded a copy of WBAN and put it online. We have a rare printed copy here, but this is such a massive reference (>1000 pages of small type, presented in a really convoluted section structure) that searching, book marking, and annotating the pdf version is a big help in using it. 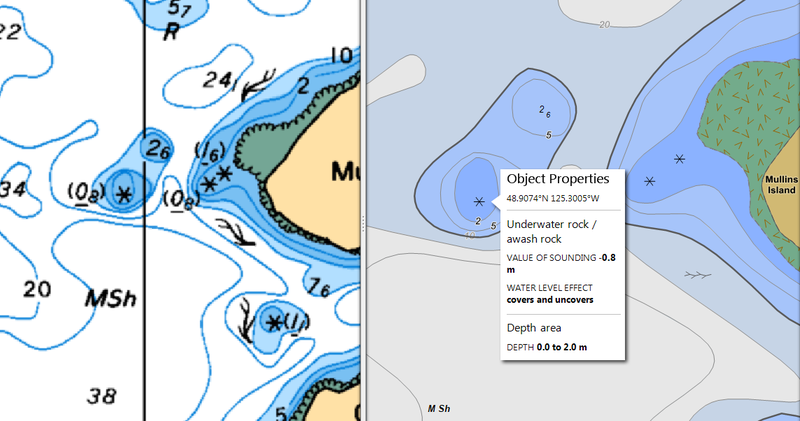 The NOAA scan (17 Mb) has useful bookmarks, but you can add your own to refine the sections, which brings up the second point we discovered. Namely—and I have to guess it is just a coincidence—but with the disappearance of the free NOAA copy from the NOAA site, there now appears a Google scan of the book that is for sale from them for $5. The Google scan (175 Mb) and is is crisper images, though the 17 MB version is perfectly readable; it also has bookmarks but they are not useful. Each has to be named to have any meaning. So now, it is easy to find this pdf copy in any search engine, but it will likely be the $5 version that is 175 Mb. If you have any ties to a university, then you can download the Google scan from Hathi Trust, which is another way to look at it online and search contents, or print individual pages. 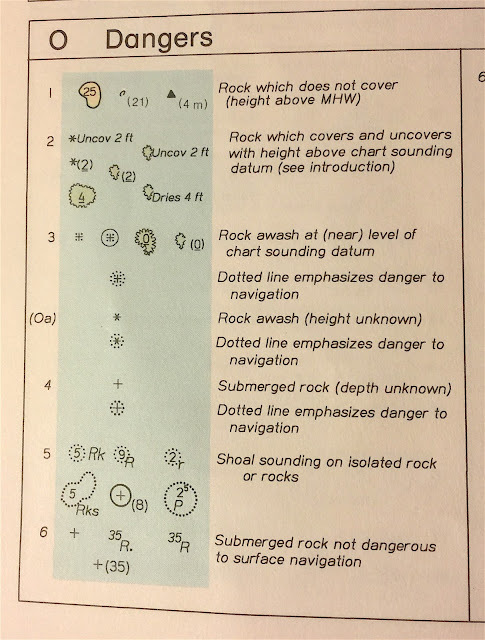 An in house copy of the Google or NOAA scan from Analog Weather is likely best bet for long term study... and there is no other kind of study possible with this book! Once again, a hearty thank you to the folks at Analog Weather for their excellent barometer resource. 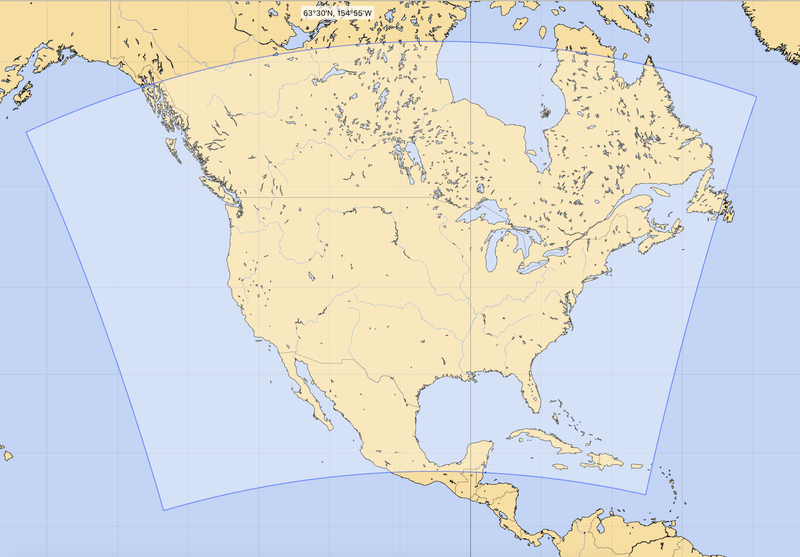 Each time we have a regional weather routing project to work on, I have to stop and remind myself about what data are available, and what are the specs. By specs I mean how often and when is the weather prediction model run, when are the data available after that, how far out does its forecast extend, what are the time steps in the forecast, and what is the resolution of the data, ie a wind point every 1.3 km or every 30 km, etc. 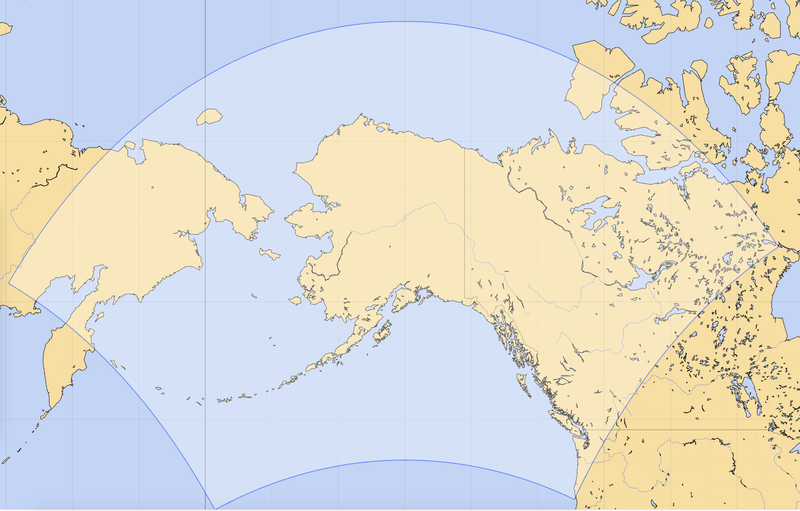 And of course, what regions do they actually cover, ie how far offshore, how far north into Canada, etc. To help myself and others with this, I have compiled here a set of notes on available forecasts and summarized the crucial specs in a Table below for quick reference. There are two broad categories of numerical model predicted wind data: Global and Regional. Global is for mid ocean or well offshore; regional models are for near coastal and inland waters. 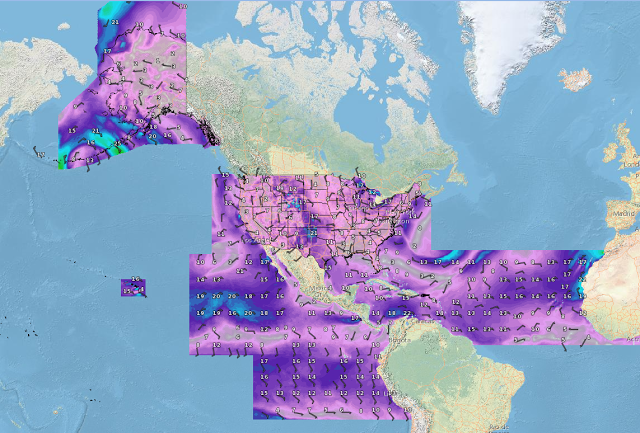 The best wind data for US inland and near coastal waters (HRRR model) were only available as commercial products until the last few weeks or so when Saildocs made them available to the public. 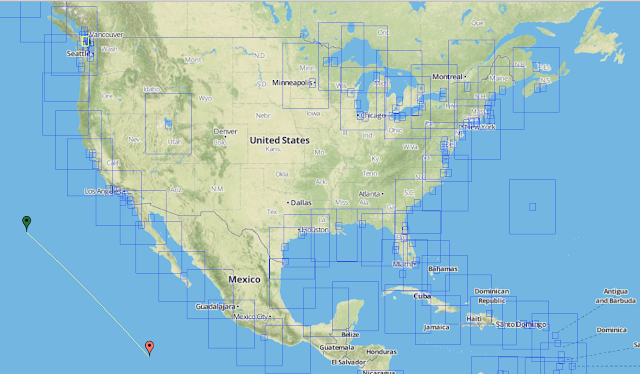 Commercial products are only legal in sailboat racing up till the starting gun, so this new development from Saildocs will have a big influence not just on sailboat racing—the data can now be used throughout any race—but this Saildocs service has a potentially huge impact on all of sailing across the US. It will likely take many months and well past next summer to fully appreciate this, but stand by for real change. We remain grateful to the commercial outlets that did pioneer the availability of the HRRR data last year, specifically Ocens and SailFlow, and their presentations of the data within their own systems are still just as convenient as they have been. Indeed, as more mariners learn the value of this data now that it is publicly available, it should only enhance the value of the commercial services they offer. Shortly, I will supplement this note with even newer developments from the Seattle-based Mac program LuckGrib that add to and extend the revolution. This should be announced shortly. Their next update includes HRRR, NAM, ASCAT satellite winds, and much more. 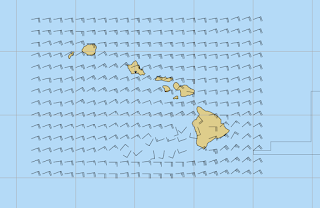 The scatterometer data (satellite winds) are a positive way to confirm any of the numerical forecasts. Having these data available as GRIB files is a boon to our analysis underway. The main focus of this note are the regional wind and pressure models. For free, public global models, the dominant model in use worldwide is the GFS model from the US, along with various ensemble presentations of that data. Ensemble means the same model is run using different initial conditions and times, and the results are averaged and compiled into a single forecast that should in principle be more dependable than any single run. Ensemble forecasts will have lower resolution and less duration than the individual runs. Some argue that the European global model (ECMWF) is superior to the GFS on some level in some cases, maybe even on average, but that model output remains commercial data, notably from Squid Sailing and PredictWind. With access to this EC data we have the opportunity to compare that with GFS in more cases. From a practical point of view, considering all related uncertainties in this process, it is difficult to anticipate many instances where the difference in forecasts (GFS vs. ECMWF) will affect our routing decisions. It is not the subject at hand, but all of these global models can be wrong in substance or in timing in various conditions. And if carefully compared to actual weather maps and text forecasts, the GFS GRIB data should meet the global forecast needs of most mariners. There are standard precautions to be taken. The GFS specs are included in Table 1 for comparison to the regional data. NAM North America, 12 km. 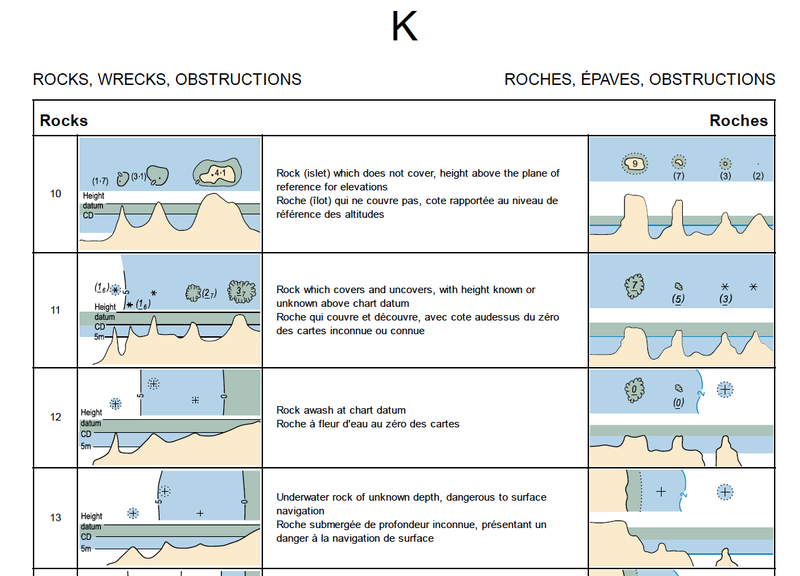 Would be used when one of the other higher res NAMs was not available. NAM AK, 6 km. 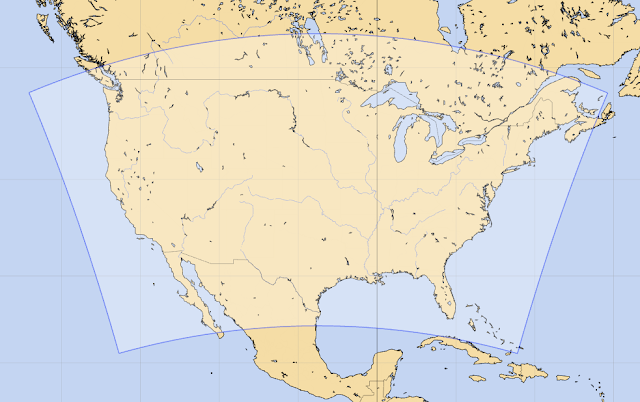 Note that it covers Pac NW at twice the resolution as the conus N. American above. We might get the impression from this official coverage map that we have a trick play in the Pacific NW and can get 6 km data from the AK run as opposed to just 12 km from the North American run, but strangely this is not the case. 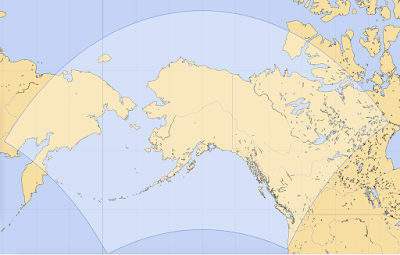 For some reason, the full AK region is not populated by data and we miss the corner we care about, as shown below. Actual NAM AK data downloaded and viewed in LuckGrib. Note the missing data in the corners. 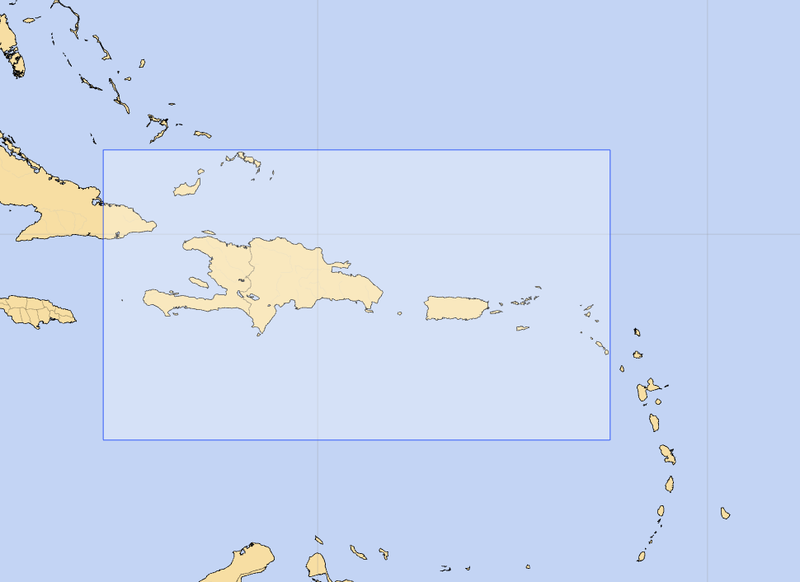 NAM Caribbean, 12 km, same as N. America, but note the super hi res of the central region below. 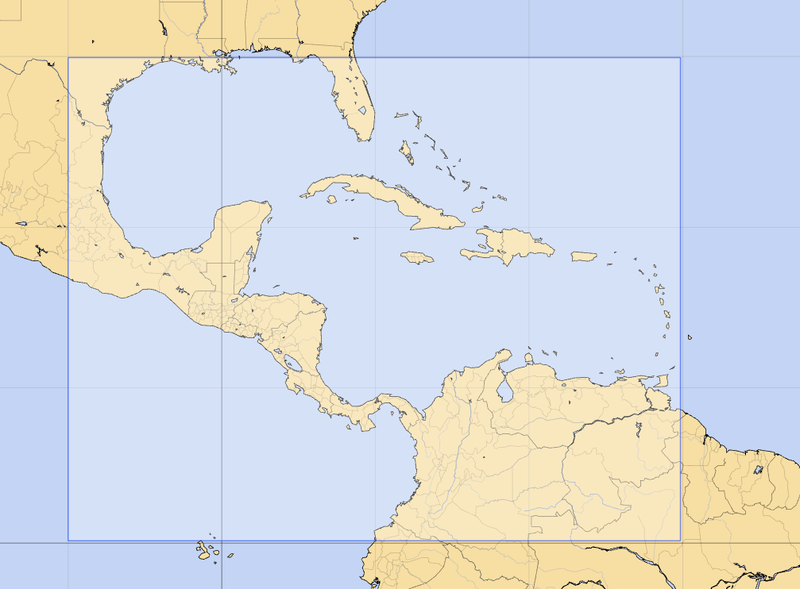 NAM Puerto Rico, 2.5 km. 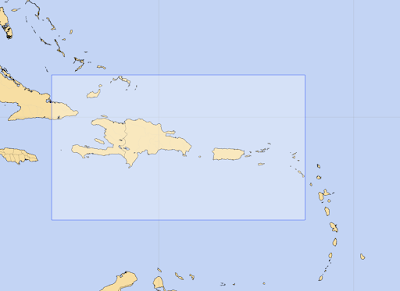 This is about state of the art in resolution, covers Virgin Islands as well. NAM HI, 2.5 km. Likely best for planning approaches till the HRRR is available. especially important in the presence of tropical storms. NAM data are available from within LuckGrib and Expedition (Expedition does not include NAM AK). The NDFD data include wind and significant wave height of combined seas. There is no pressure data. See the NAM or HRRR for pressure. 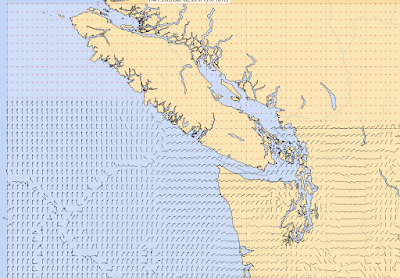 NDFD data 3 km, goes about half way up Vancouver Island. 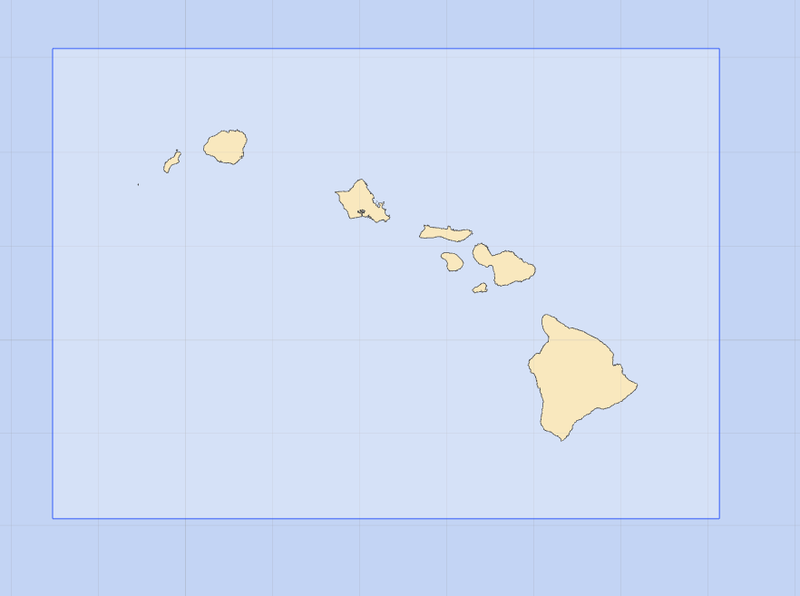 This coverage map from the NSDF site. Pac NW limits on NDFD. About halfway up the west coast of Vancouver Island then to top of the Gulf Islands. 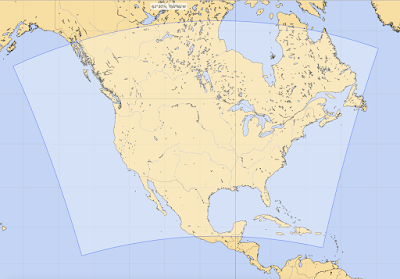 NDFD HI coverage, 3 km. Another view from an Expedition screen cap. NDFD data are available from Expedition, Saildocs, and the Ocens WeatherNet (commercial data). HRRR (3 km). The High Resolution Rapid Refresh model is updated hourly, corrected for all the latest observations, but it only extends out 18 hours. 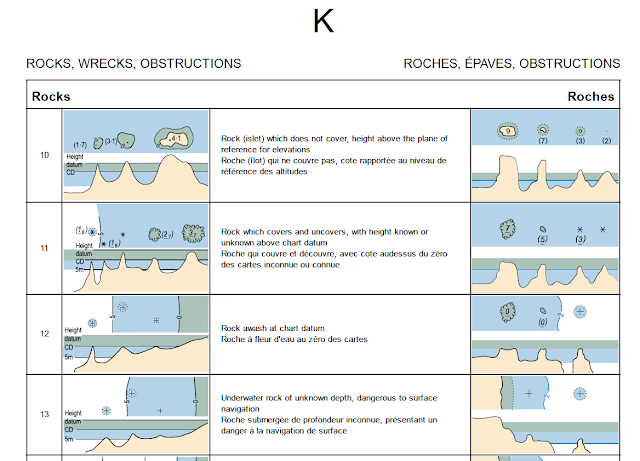 It is available from LuckGrib, Expedition, Saildocs, and Ocens. 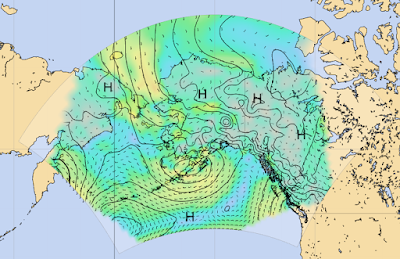 If you have live Internet connections while underway, these are likely the best wind forecasts available. The data are available about 1.5 to 2.5h after each runtime. That is, a model run at 1400 should be available to you by about 1530. Thus if you download an 18-h forecast at 1535, your first data point could be at 1400 and extend to 0800 the next day. Download at 1525, and your first point would be 1300, extending to 0700 the next day. 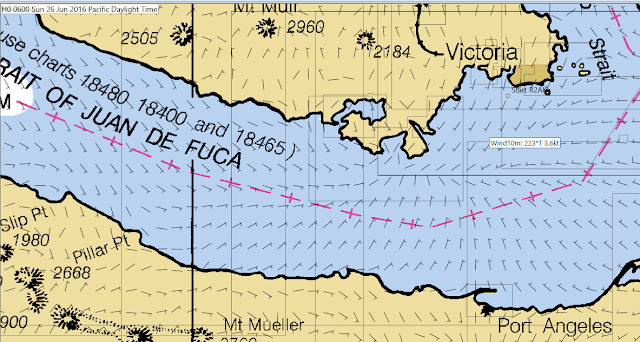 The resolution between wind data points is fine enough to do some level of automated sailing route optimization, although it will take more experience with this to learn the limits. Wind and pressure are available. The HRRR model actually has wind forecasts every 15 minutes, but the 15-min steps data are not yet available in GRIB format from any source I know of.... ie it is indeed rapid in refresh and time resolution, as it was motivated by tornado and squall forecasting, which it can indeed do! HRRR 3 km. 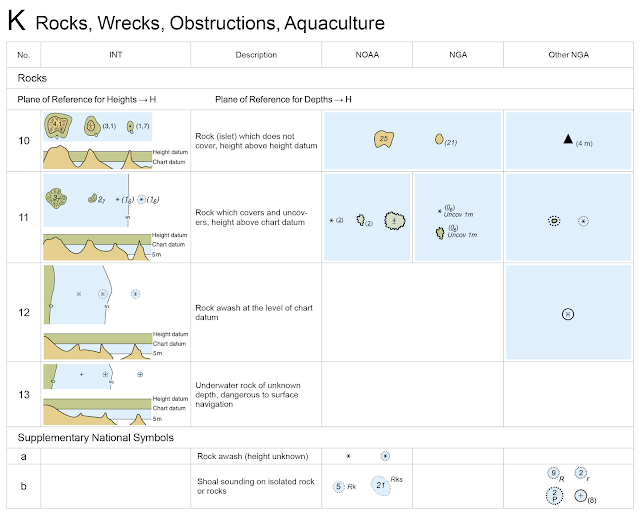 A huge coverage for this timely and hi-res data. 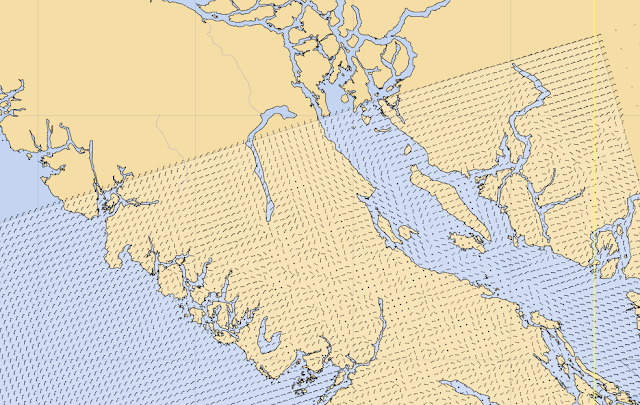 Extends N to Seymour Narrows in BC, and covers all of the Great Lakes. Screen cap of coverage from LuckGrib. Pacific NW limit of the HRRR data. Sample HRRR data. 18h of forecasts. 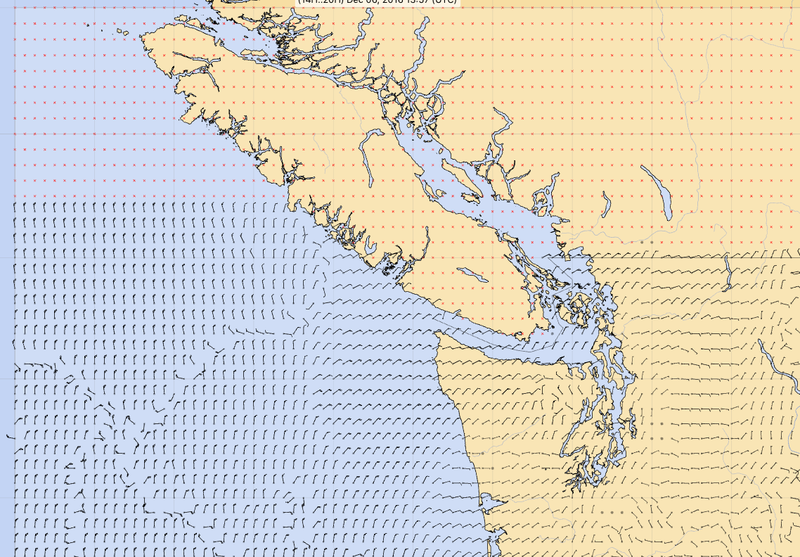 The data go north to Campbell River... ie perfect for the R2AK run to Seymour Narrows. And for those navigating by portable device, there is a super nice way to see the HRRR wind data underway, but not in a form for numerical weather routing. 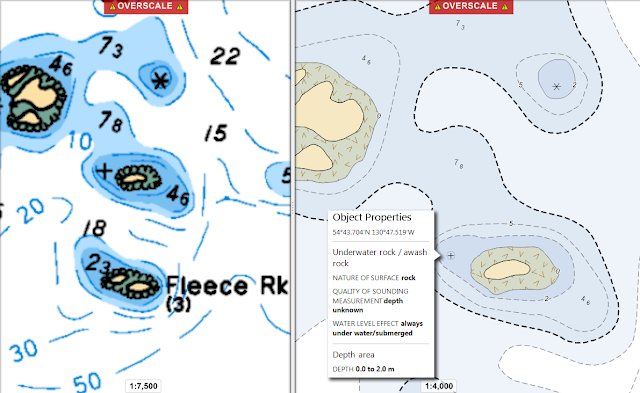 Use the SailFlow app in iOS or Android, and surf around in the set up to find HRRR. Summary of the Regional Forecasts compared to the Global GFS. 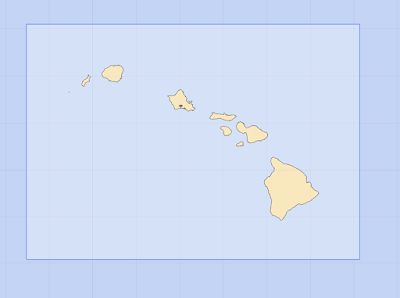 See the maps above for the coverage regions. 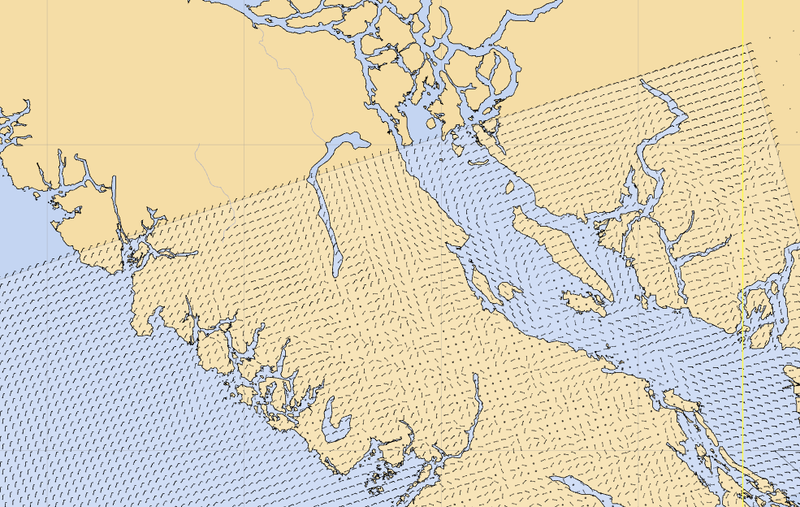 PredictWind PWG/PWE (1 km, 8 km). 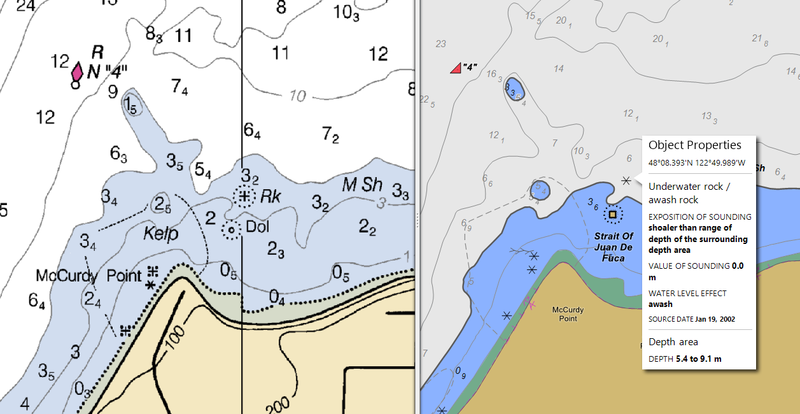 The 8-km data are available in coastal waters, nearly globally, and the 1-km data are for many popular sailing areas worldwide. For more data on the model specs and available times, see this link at predictwind.com. Predict Wind commercial hi res data. 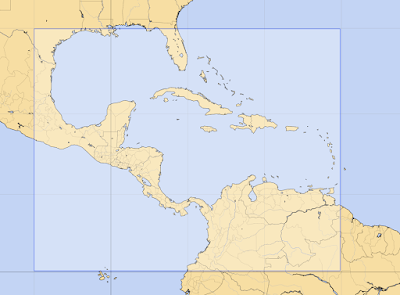 Large regions are 8 km, small are 1 km. A similar distribution of data options apply globally. This is a screen cap from PredictWind Offshore app. Set the route across your route and it will select all data needed. This product has several advantages when preparing for a race or not racing when commercial products are restricted. First it is super easy to access in Expedition or by email, and the 1 km hi-res models extend out 36 hours, compared to 18h with HRRR. They also have a convenient (Mac or PC) app called Predictwind Offshore that lets you either request and look at the data online, or what is often more convenient, it will prepare a template request that you just email to them when you need an update. The larger regions of 8 km are 390 kb each, the smaller regions of 1 km data are 250 kb each. The 8 km (also hi res) goes out a 7 days—like the lower res GFS, more or less into the realm of the unknown. The only drawback to the data is its age, since it takes time to incorporate the ECMWF and other adjustments they make, the data can be 8 to 12h old when it arrives. 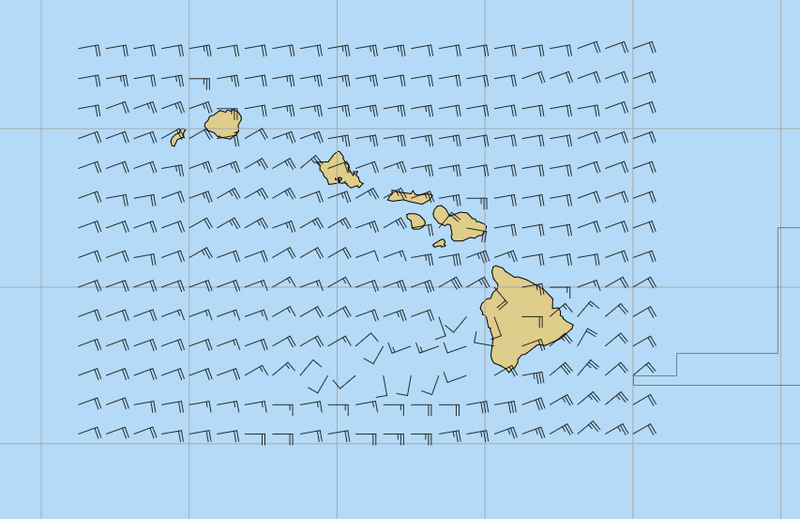 Predict Wind also has a weather routing/optimizing feature that seems to work pretty well. You can also use custom polars for the analysis. 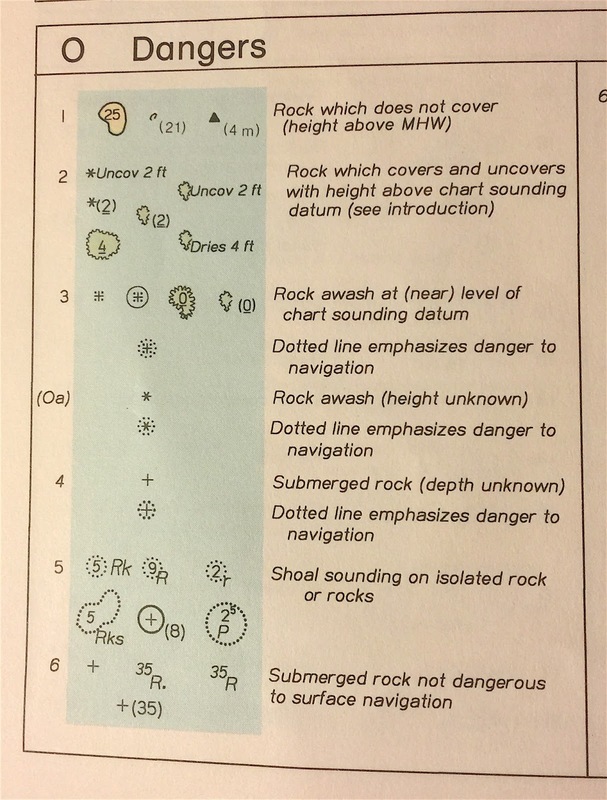 For inland waters, however, it does not account for currents, which leaves Expedition at an advantage for that— but I should add here, if you do not have good current data, then you could be better off without using currents at all! PW does offer and use ocean currents for the ocean routing. They remain unique with their new inclusion of ECMWF data. UW WRF (1.3 km). 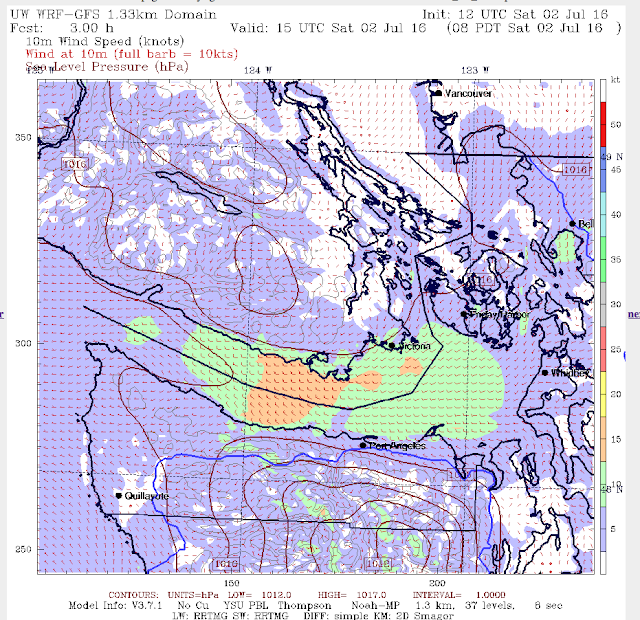 Unique to our local Pacific NW waters, we should always remember the UW WRF model, which is likely as good as any, but only available as a graphic format; there is no grib format. The model is run at about 00 and 12z daily and data would typically be 8+ hr old when we get it, and indeed they might not be there when you want them. This is a public service of the UW Atmospheric Sciences Dept., with no guarantees. UW WRF model, run every 6h extends out 60h. This model could be the best model for the region, but it is not updated often enough to compete with the HRRR, which is updated with all the latest actual wind observations every hour. Nevertheless, it is worth printing out the UW data before the start, and with a good connection offshore, perfectly legal underway. You can request the image forecast underway using saildocs.